1. 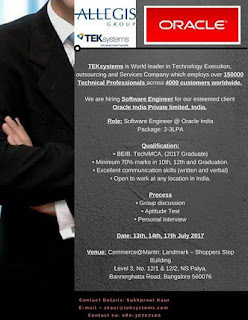 Teksystem hiring 2017 Fresher for ORACLE Client! Employment Details: You will be an employee of TEKsystems deputed at client location. Date of walk in : 14th July 2017 and 15th July 2017. 1) Will be working in 8-bit/32-bit microcontrollers. 3) Will be working in Embedded protocols like I2C, UART, SPI, MODBUS, TCP/IP, CAN. • Good Programming Knowledge in C.
-They will be getting exposure in their core field. Timings :10.30 a.m. to 12.30 p.m.
Troubleshooting Hardware/Networking/OS related queries of our global customers Over Phone which involves working in different time zones. Take calls from Global customers and initiate the right response to them, positively and professionally. Provide remote solutions to problems, enquiry problems and explain the solution in such a way that non-technical users understand. Good Communication skills is Mandatory. Qualification : Bachelor's Degree in any stream / Under Graduates. Passed out year - Any with no percentage criteria. 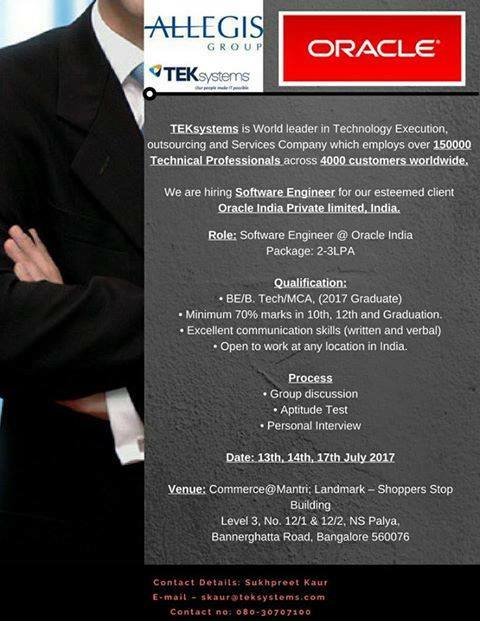 Walkin Interviews on 14th July Graduates with 0-2 Years of exp. 0-1 years of work experience in banking, finance and accounting.